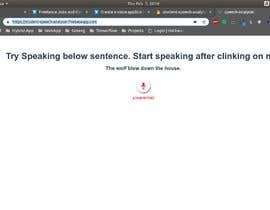 This application would be a web app that would ask kids to say a English sentence or phrase, would put it through a speech recognition engine (Google, Amazon, etc. but I am open to suggestions). 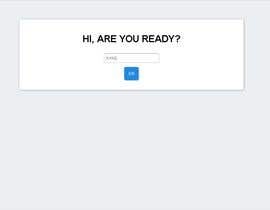 If the engine correctly recognizes the sentence or part of the sentence, a completion score is returned to the user. The number of words matched should be returned. The engine should be tuneable to gage the clearness of the speech of beginners or of native speakers. The app should show which words the user got right and the words they got wrong. See the spec in the files section. There are also examples of 9 sentences, spoke once by a native speaker and once by a non-native speaker. - The winner will be the application that can do the best job of recognising kids speaking. Therefore, there will need to be a way to run the app with live people. Web only for now. App perhaps in the future. This needs to be reat-time. 2. Are you interested in realtime results only. Or you also want to save results for each student. and want to prepare results / reports later ? Hi! 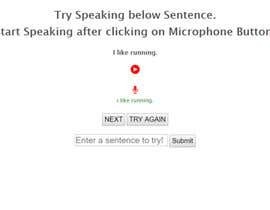 Quick question: before recognition of text, do you want the application to be able to record voice via microphone, or do you want to upload audio files? Hi Folks, if you are planning to submit an entry, please click on the "I will submit an entry later" button. I want to get an idea on the number of entries I can expect. by using reactjs full application can be build only on front-end and no backend will be required is that fine ?? That's fine, as long as it can access speech recognition engines and is configurable. Yes, however some type of front end is probably required to be able to test the back end. So a basic website makes sense. 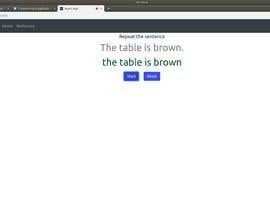 So you want a background service that takes a text sentence and a voice as a input and returns number of matched or correct word. You don't want a website that does these things. That's good. It's what I was thinking. Background service mostly. The target is windows machines and mobile web. What kind of app should it be? Windows OS? MacOS based? iPhone? Android? Windows Phone? Or just a background service which can be consumed by your custom apps?